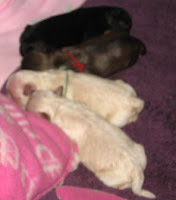 Its best NOT to meet Ella's puppies unless your ready for a puppy of your own. All four have been taken, 3 of them are going to siblings of Kim. The other one is going to one of her roommates grandmothers. I'm excited because now she'll be able to keep tabs on all the pups instead of just one. In other news Daisy is finally out of heat! So it looks like I will try to breed her in the spring when her next heat cycle begins. It will be interesting to see how that goes. Jake has never been around newborn puppies, but he's been good with them once they get older. As usual the names they started with at birth have been changed. 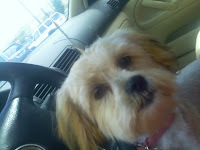 Sadie AKA Sugar has been adopted by on of Kim's roommates for her grandmother. Smokey AKA Hershey has been adopted by Kim's nephews who spent the last several months saving up their money! I went down Saturday to Kim's since I was having an open house trying to sell my house. The puppies have their eyes and ears open and are getting stronger, but still pretty wobbly getting around. Daisy wanted to get in there and see what these little things were... Jake could care less he just wanted to play! 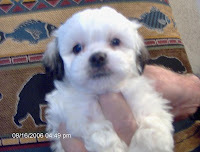 Many people have asked me what is a Shih Poo.. so here are some detail as well as some pics of older Shih Poo's I found on the internet. A Shih-poo is a mixed breed dog that is produced by mating a Poodle and a Shih Tzu It is one of many Poodle hybrids that have been bred in an attempt to combine the characteristics of the Poodle, such as its intelligence and low-shed coat, with the desirable traits of another breed- in this case the Shih Tzu. Some owners prefer Shih-Poo's over Shih Tzus because the snout of the dog is less pushed in, therefore alleviating many breathing problems that shih-tzus can experience. 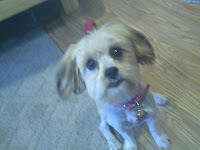 The Shih-poos' (as with most mixed-breed dogs) appearance varies significantly. It will take characteristics from both of its parents. One consistent trait of the breed is its size, normally weighing about 10 lb. It is long coated, though its coat texture can be straight, curly, or wavy. 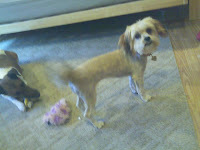 Normally the Shih-poo's general build will be somewhere between that of its parents. It can be any colour or colour combination. Partially because of its widely varying appearance it is not recognized by any major kennel club.They are very adorable and a kind dog. 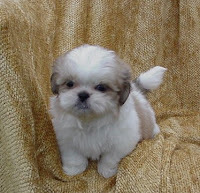 The Shih-poos' parent breeds share many temperament traits, more so than appearance. Therefore it is easier to generalise their personality. They are normally intelligent, alert, friendly, and devoted to their owners though they can often be shy around strangers and like many small dogs they need to be properly socialized around young children. They are demonstrative and seem to enjoy being fawned on and being the centre of attention. 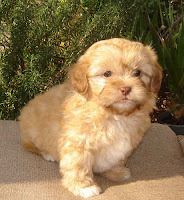 The Shih-poo tend to be very sociable with other dogs and they also do well around other pets of all species. 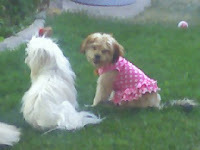 Shih-poo's are usually very intelligent and eager to please their owners. These traits make them very trainable. They learn quickly and seems to enjoy showing off tricks. 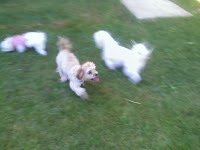 Wow there were a lot of teeny tiny dogs! 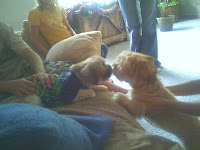 Ella had a fun with all her friends and Daisy was kissing and licking everyone. Here are some pics from the party.